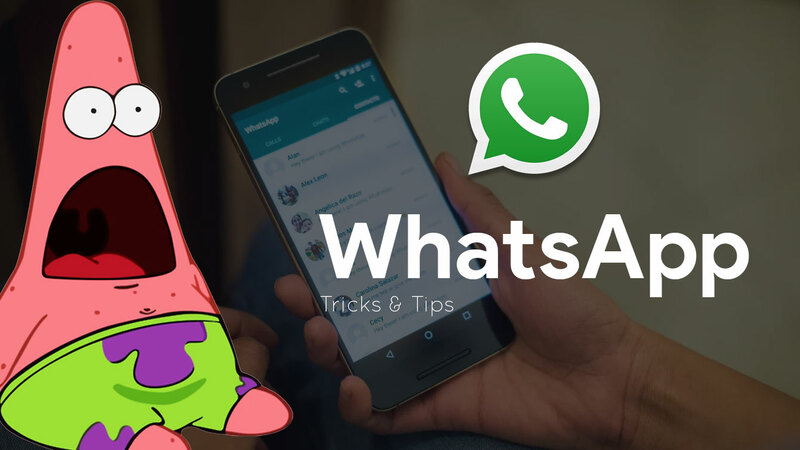 20 WhatsApp tricks and tips that you might not know. WhatsApp, an Android App which is currently owned by Mark Zuckerberg. It is increasing and improving everyday with lots of new features in each updates. On June 2015 WhatsApp’s CEO reported that they have around 800 million Active users currently, which is increasing everyday. If you are not much into Searching through Apps, you might have not found few of this features in WhatsApp. With the release of Material design, WhatsApp also released some new features you might have not observed. So, without wasting anymore time lets start with WhatsApp tricks & features. 1.1 1. 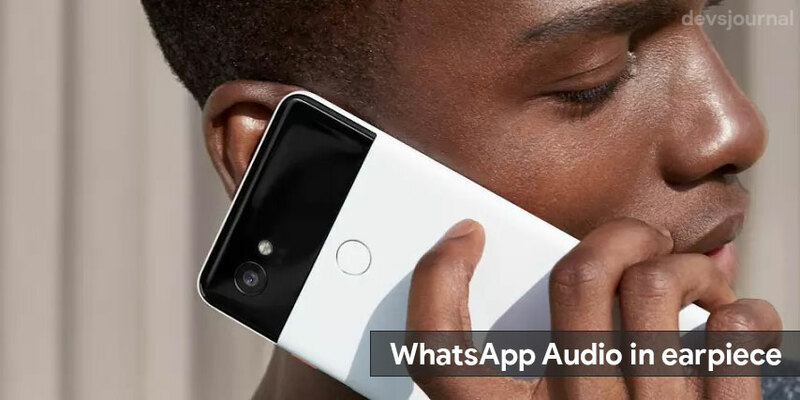 How to hear Whatsapp Audio through earpiece? 1.2 2. How to use Whatsapp without revealing your number? 1.4 4. How to make the font of your message bold, italic or ̶s̶t̶r̶i̶k̶e̶d̶? 1.5 5. How to unblock yourself from anyone Whatsapp? 1.7 7 How to use Whatsapp on your PC? 1.9 9. How to check if any of your friend has blocked you? 1.10 10. How to check if your friend has saved your number? 1. How to hear Whatsapp Audio through earpiece? Often your friends might send you certain secret or abusive Whatsapp audio messages which you can’t play in front of your family or in case you are in certain places like a metro. But the good thing is that even if you don’t have earphones, you can listen to the audio privately without letting anyone hear. For that you just need play the Audio and hold the phone near your ears as if you are making a call. And then you will hear the Whatsapp Audio through the phone’s earpiece. In order to hear the audio through the phone’s speaker hold the phone away from your ear. This feature is facilitated by the proximity sensors of the phone. 2. How to use Whatsapp without revealing your number? This trick can be used in order to hide your whatsapp number or even if you want to use two different WhatsApp account on your phone. In order to do that, you need to go to Settings of your phone. Then using the dual app feature, clone your whatsapp and simply change the number of the cloned Whatsapp. But if in case your phone does not have dual app feature, you can still clone Whatsapp using Parallel Space. In Parallel space, you can clone Whatsapp on your phone. Now if you do not have a separate number to use in the cloned whatsapp, you can install an app named Primo and get dummy numbers from it. Go to Settings App > About phone > Status> Wi-Fi MAC address. Note down the address. Now Spoof your device’s mac address, using this method. Download WhatsApp on your phone and enter the other person’s mobile number. Enter the verification code received on your the person’s phone. Now you and the other person can use the same WhatsApp at the same time without anyone getting logged out. 4. How to make the font of your message bold, italic or ̶s̶t̶r̶i̶k̶e̶d̶? Whatsapp allows you to change the decoration of the font of your message. Now you can make the fonts bold, italic or even striked. Don’t you want to know how to do that? It is quite simple. Have a look on the following patterns. 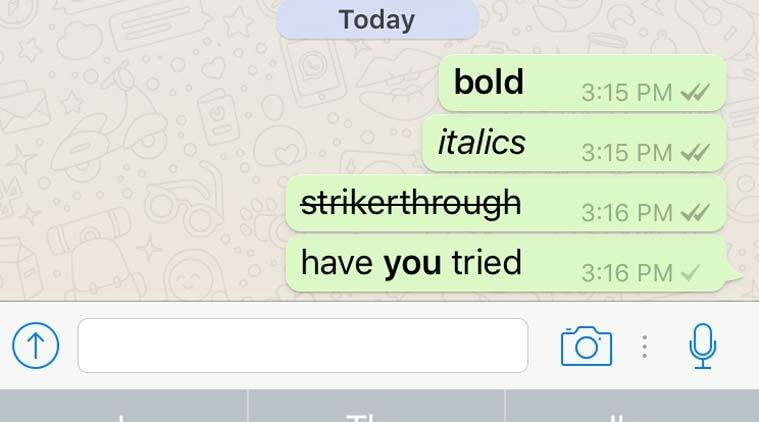 Now just replace Your Text with your own message in order to send bold, italic and striked messages. 5. How to unblock yourself from anyone Whatsapp? There are chances that in certain cases your friend might have blocked your number on their Whatsapp Due to which, you are not able to send messages to him or her. Well, don’t worry! This trick will show you how you can How to unblock yourself on WhatsApp without even touching your friend’s phone. You will have to go to the settings of your Whatsapp Account. Then tap on “Account” and find “Delete my account”. There you will have to confirm your account and tap on delete. Then uninstall the Whatsapp app and restart your phone. After that go to Play Store again and install Whatsapp once more. Then sign up on Whatsapp again with the same number. This will unblock your number from any person’s phone. It is very important to have keep your whatsapp secure and resilient against any unscrupulous activity. Whatsapp has introduced this two step verification for making your account more secure. However this is an optional feature. To enable two-step verification, open WhatsApp > Settings > Account > Two-step verification > Enable. Once done, any attempt to verify your phone number on WhatsApp must be accompanied by the six-digit PIN that you created using this feature. 7 How to use Whatsapp on your PC? Now you can use your Whatsapp in personal computer along with your phone. You will have to download the whatsapp for PC from 32-bit & 64-bit. After installing the software on your PC, as you launch it, you will see a barcode on your computer screen. Now on your phone, click on the three dots on the top left of your Whatsapp account and then find and tap on “Whatsapp Web” This will open the camera of your phone. Scan the barcode of the screen of your PC and within few seconds the same whatsapp account will be synced in the PC. If you don’t want to download any WhatsApp Windows app, you can use WhatsApp web. It’s pretty easy and loads quickly. Open your WhatsApp and open Option menu, select WhatsApp Web. Now open WhatsApp Web, scan the QR Code shown on your computer screen through your phone. Done ! It will take few secs to setup your WhatsApp on your PC. How about you read the status of your whatsapp friends without letting them know that you have seen their status. This is actually a very simple trick. You just need to go to the settings of your Whatsapp app , then head on to privacy and uncheck the read receive option over there. Now your friends will not know that you have read their status. 9. How to check if any of your friend has blocked you? Sometimes our friends with whom we chat frequently or regularly might block us for some reason. On blocking, we can’t send message to them and also not see their status or even see their display picture. But blocking on WhatsApp is bit tricky. What if the person has not blocked you but have removed you from their contact list? If the person has set to show their status, picture only to their contacts, you might think they have blocked you. So if you want to be confirm if any friend has blocked you, try to create a new group with only that friend. If the group gets created but your friend is not added as a member, then you can confirm that he/she has blocked you. 10. How to check if your friend has saved your number? Just like checking if someone has blocked you, you can also check if someone has saved your number in their phone or not. In your whatsapp Spp, see the status tab and check for the status of that particular friend. If you cannot find the status of your friend, you can make sure that he or she has not saved your number. If you are a part of many groups or you chat too much, you might be get irritated, that each and every image is shown in your gallery making a complete mess. If you don’t want your images to be shown in your Camera Roll (iOS) or Gallery (Android) you simply follow below steps, and get get a clean camera roll. iOS : Go to WhatsApp Settings > Privacy > Photos and toggle WhatsApp off. Open any File manager (eg : ES File explorer). Tap New, at the bottom left in any folder. Now, your images won’t be shown in gallery, but you can see it int recent media in your WhatsApp. Sometimes group conversations create a lot of noise. You may not want to leave the conversation, but you probably don’t want a notification every time someone chips in. iOS : Open Group Chat, click on Group Subject to get into Group Info than click on mute. Android : Open Group Chat, click on Option button in your Android than tap mute. You can select the time period to mute or remove the tick from Show Notifications. If you are a type of person who loves to read their past messages or keep important records/messages than there is a good option for you. WhatsApp backups your Chats every morning at 4 AM. If you have deleted your chat by mistake than you can simply restore it back. The easiest way to recover a recently deleted message is to uninstall the app and reinstall it. During the process it will ask if you want to restore from backup. This will cover the last seven days. If you want to restore an older chat on Android, use an app like ES File Explorer and go to sdcard/WhatsApp/Databases to see your backups. If mostly you chat with the same person, you can create a shortcut of their chat on your homescreen easily. All you have to do is, Goto Main chat screen of WhatsApp > Press and hold the chat of that person > Select “Create a conversation Shortcut”. That’s all. If you don’t want to show your last seen (Last Active time) to everyone. You can simply Goto WhatsApp Settings > Account > Privacy > Last seen > Select Nobody. If you want to keep your data like Profile pic, Status & last seen private, you can hide them for non-contact users i.e It will be only visible for people who are in your Contact list. Goto Settings > Account > Privacy > Select your preference for each option. If you want to send a text message to a group of people, you don’t have to waste your time by sending it individually to everyone. WhatsApp has an option to save your time i.e Send messages in one click. This feature if known as Broadcast message. First, copy the message your want to send. Goto main chat screen, click on option button. Select broadcast message, than select the people you want to send the message. Now just paste your message and click on send. If you have switched to a new phone, you simply carry your WhatsApp messages with you. Just Goto WhatsApp settings > Chat Settings > Backup all your Conversation. Now you can transfer this backup file which would be stored in your SDcard / Internal memory (Find WhatsApp Folder). Just insert that Sdcard in your new phone and Install new WhatsApp. You’ll be promted to restore chat. You can also transfer the backup file through Bluetooth. Along with Blue ticks feature WhatsApp also released Who read feature, which shows When and Who has read your Chat in group. You can also find who has not yet read the message. In private chat you can check when was your message read. To find this, just click and hold on the message you have sent, Click on the (i) icon at the top. You’ll find everything there. If you want features like, hide last seen, hide blue ticks (Others can’t see yours but you can see their blue ticks), customize WhatsApp colors and more features, you must check GBWhatsApp app. Many of you might be aware of the above tricks, its for the people who don’t spend much time in searching through WhatsApp. Anyways, thanks for reading. Don’t forget to leave a like & share. Have a good day !